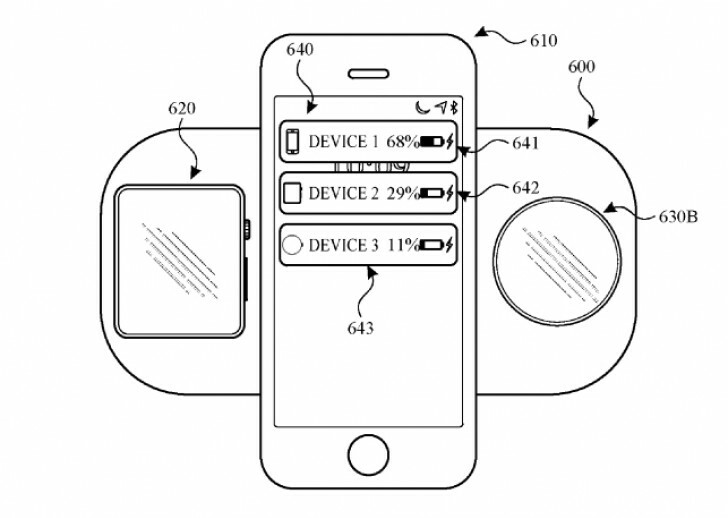 In a recent patent from Apple, the mythical AirPower wireless charging mat makes an appearance. Although there's no mention of the name in the document, it's easy to assume that we are talking about the very same device and it goes into details about the features. By now, we know that the AirPower charging mat can be used to charge multiple devices simultaneously such as your iPhone, AirPods and Apple watch. But while it does that, it can also communicate with each and every one of them in more than just one way. The charger gives unique IDs of the charged devices in order to track the battery level and know when to stop charging the said device. In addition, it will be able to tell which one has the biggest screen and show the battery level of each device so you can see the charging status at a glance. Moreover, the phone can prompt you with a message warning you if the battery charge is enough to last you through the day. It takes into account your usual charging habits and your appointments and meetings in your calendar entries. The latest report going around suggests that the device will be announced early next year. The complexity of the charging mat and the advanced features that it offers are the main culprits for the delay so far. Well we saw this more than a year ago. By tthe way 450 for a wireless charger compatibl with only apple devices no thanks. I will go womit rather. Innovation and invention are completely different. Apple is being innovative in how we charge all our devices simultaneously and work together. ItÂ’s clearly more than just 3 Qi chargers slapped into a wide pad.